Agalychnis lemur is a small slender tree frog that occurs in the premontane rainforests of lower Central America. 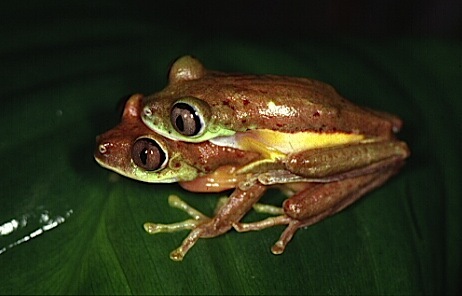 It is the smallest of the Costa Rican Leaf Frogs, with a typical average snout-vent length of 30-45mm (Kubicki, 2004). Females are typically larger than males. The dorsal skin is smooth and the colour ranges from bright yellow-green during the day to red-brown at night. Individuals have dark flecks on the dorsal surface and this is a feature that varies between different populations of these frogs. The eyes are large and contain a vertical pupil. Unlike some other Agalychnis, the lower eyelid is not reticulated. The iris during the day is silver or pale gold, changing to purplish grey or brown colour at night. This iris colour is also surrounded by black. A. lemur is active during the night and sleeps during the day on the underside of leaves. The frogs are highly nocturnal, leaving their daytime resting places to hunt for food and reproduce (Jungfer and Weygoldt, 1994). The breeding sites of P. lemur are leaves overhanging pools or slow moving streams (Kubicki, 2004). Egg masses are laid on the surface of leaves in similar fashion to other members of the genus. The species produces a mate attraction call that consists of a series of single, short “ticks” (Savage 2002). It also produces a more rapid encounter call and release calls, used during male-male interactions (Jungfer and Weygoldt, 1994). Males often engage in aggressive interactions with other males, grappling with opponents. Jungfer & Weygoldt (1994) were also first to describe the breeding biology of the species in detail with specimens in captivity. Abdel-Wahab, YHA, GJ Power, PR Flatt, DC Woodhams, LA Rollins-Smith, and JM Conlon. 2008. A peptide of the phylloseptin family from the skin of the frog Hylomantis lemur (Phyllomedusinae) with potent in vitro and in vivo insulin-releasing activity. Peptides 29(12): 2136-2143. Amiche, M, A Ladram, and P Nicolas. 2008. A consistent nomenclature of antimicrobial peptides isolated from frogs of the subfamily Phyllomedusinae. Peptides 29(11): 2074-2082. Brem, FMR and KR Lips. 2008. Batrachochytrium dendrobatidis infection patterns among Panamanian amphibian species, habitats and elevations during epizootic and enzootic stages. Diseases of Aquatic Organisms 81: 189–202. Cannatella, D. C. (1980). 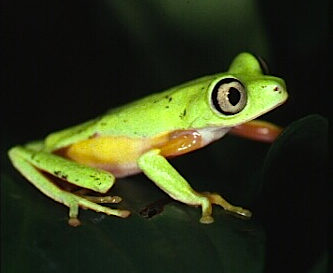 A Review of the Phyllomedusa Buckleyi Group (Anura: Hylidae). Occaisional Papers of the Museum of Natural History, The University of Kansas, Lawrence, Kansas. 87: 1-40. Crook, T. (2007). Conservation genetics of Hylomantis lemur, a Central American Treefrog of the Hylid subfamily Phyllomedusinae. Thesis submitted to the University of Manchester for the degree of M.Sc, in the faculty of Science. School of Biological Sciences, University of Manchester, England. Conlon, JM , DC Woodhams, H Raza, LCJ Leprince, T Jouenne, H Vaudry, and LA Rollins-Smith. 2007. Peptides with differential cytolytic activity from skin secretions of the lemur leaf frog Hylomantis lemur (Hylidae: Phyllomedusinae).Toxicon 50(40): 498-506. Duellman, WE. 1968. The genera of phyllomedusine frogs (Anura: Hylidae). University of Kansas Publications, Museum of Natural History 18: 1–10. Duellman, W. E. (1970/2001). Hylid frogs of Middle America. Society for the Study of Amphibians and Reptiles. Ithaca, New York. Duellman, W. E., and Trueb, L. (1986). Biology of Amphibians. John Hopkins University Press. Baltimore and London. Faivovich, J, CFB Haddad, PCO Garcia, DR Frost, JA Campbell, and WC Wheeler. (2005). Systematic review of the frog family Hylidae, with special reference to Hylinae: Phylogenetic analysis and taxonomic revision. Bulletin of the American Museum of Natural History: 1-240. Foster, M. P. L., P. N. La Marca, E., Masters, K. L., Merino-Viteri, A., Puschendorf, R., Ron, Sanchez-Azofeifa, G. A, Still, C. J., Young, B. E. (2006). 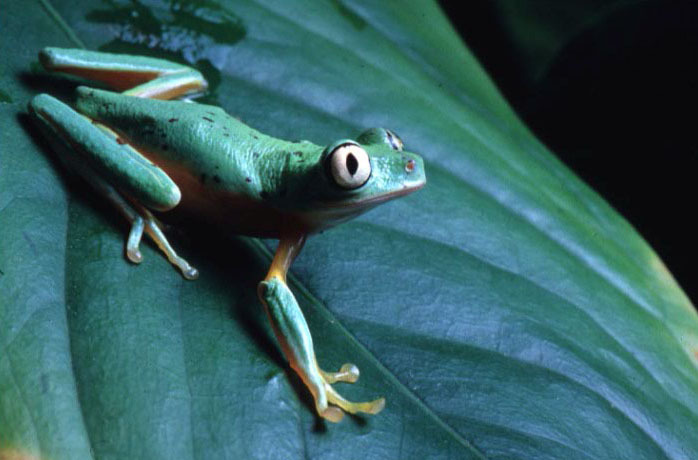 Widespread amphibian extinctions from Epidemic disease driven by global Warming. Nature. Vol 439. Funkhouser, AB. 1957. A review of the Neotropical tree frogs of the genus Phyllomedusa. Occasional Papers of the Natural History Museum of Stanford University 5: 1–90. Goldberg, J and M Fabrezi. 2008. Development and variation of the anuran webbed feet (Amphibia, Anura). Zoological Journal of the Linnean Society 152(1): 39-58. Goldberg, SR and CR Bursey. 2008. Helminths from fifteen species of frogs (Anura, Hylidae) from Costa Rica. Phyllomedusa 7(1): 25-33. Gomez-Mestre, I., Wiens, J. J., and Warkentin, K. M. (2008). Evolution of adaptive plasticity: risk-sensitive hatching in neotropical leaf-breeding treefrogs. Ecological Monographs, 78, 205-224. Gray, A. R (2011). Notes on Hybridization in Leaf frogs of the genus Agalychnis (Anura, Hylidae, Phyllomedusinae), Cornell University and the National Science Institutes’ ArXiv:1102.4039v1. Jungfer, KH and P Weygoldt. 1994. The reproductive biology of the leaf frog Phyllomedusa lemur Boulenger, 1882, and a comparison with other members of the Phyllomedusinae (Anura: Hylidae). Revue française d’aquariologie 21(1-2): 57-64. Kubicki, B. (2004). Ranas de hoja de Costa Rica. Leaf-frogs of Costa Rica. Instituto Nacional de Biodiversidad (INBio). Costa Rica. León-Azofeifa, P. E. 1970. Report of the chromosome numbers of some Costa Rican anurans. Informe del número de cromosomas de algunos anuros costarricenses. Revista de Biología Tropical 17(1): 119-124. Lips, K., Brem, F., Brenes, R. Reeve, J. D., Alford, R. A., Voyles, J., Carey, C., Livo, L., Pressier, A. P. and Collins, J. P. (2006) Emerging infectious disease and the loss of biodiversity in a Neotropical amphibian community. PNAS 103(9): 3165-3170. Myers, C.W. and Duellman, W.E. 1982. A new species of Hyla from Cerro Colorado, and other tree frog records and geographical notes from western Panama. American Museum Novitates: 1-32. Pounds, JA, MPL Fogden, JM Savage, and GC Gorman. 1997. Tests of null models for amphibian declines on a tropical mountain. Conservation Biology 11(6): 1307-1322. Rollins-Smith, LA. 2009. The role of amphibian antimicrobial peptides in protection of amphibians from pathogens linked to global amphibian declines. Biochimica et Biophysica Acta – Biomembranes 1788(8): 1593-1599. Ruiz-Carranza, P.M., Ardila-Robayo, M.C. and Lynch, J.D. 1996. Lista actualizada de la fauna de Amphibia de Colombia. Revista de la Academia Colombiana de Ciencias Exactas, Físicas y Naturales: 365-415. Savage, J.M. (2002). The Amphibians and Reptiles of Costa Rica: A Herpetofauna between two Continents, between two Seas. University of Chicago Press, Chicago and London. Savage, JM and WR Heyer. 1967. Variation and distribution in the treefrog genus Phyllomedusa in Costa Rica, Central America. Beiträge zur Neotropischen Fauna 5(2): 111-131. Schulte, R. 1977. Mit Geisterbeck schleict er durchs Geast: Der Lemurfrosch (Phyllomedusa lemur). Aquar. Mag. 11(3): 98-103. Tyler, MJ and M Davies. 1978. Phylogenetic Relationships of Australian Hyline and Neotropical Phyllomedusine frogs of the family Hylidae. Herpetologica 34(2): 219-224.